Another history pageturner from the authors of the #1 bestsellers George Washington's Secret Six and Thomas Jefferson and the Tripoli Pirates. The War of 1812 saw America threatened on every side. Encouraged by the British, Indian tribes attacked settlers in the West, while the Royal Navy terrorized the coasts. By mid-1814, President James Madison's generals had lost control of the war in the North, losing battles in Canada. Then British troops set the White House ablaze, and a feeling of hopelessness spread across the country. Into this dire situation stepped Major General Andrew Jackson. A native of Tennessee who had witnessed the horrors of the Revolutionary War and Indian attacks, he was glad America had finally decided to confront repeated British aggression. But he feared that President Madison's men were overlooking the most important target of all: New Orleans. If the British conquered New Orleans, they would control the mouth of the Mississippi River, cutting Americans off from that essential trade route and threatening the previous decade's Louisiana Purchase. The new nation's dreams of western expansion would be crushed before they really got off the ground. So Jackson had to convince President Madison and his War Department to take him seriously, even though he wasn't one of the Virginians and New Englanders who dominated the government. He had to assemble a coalition of frontier militiamen, French-speaking Louisianans,Cherokee and Choctaw Indians, freed slaves, and even some pirates. And he had to defeat the most powerful military force in the world--in the confusing terrain of the Louisiana bayous. In short, Jackson needed a miracle. The local Ursuline nuns set to work praying for his outnumbered troops. And so the Americans, driven by patriotism and protected by prayer, began the battle that would shape our young nation's destiny. 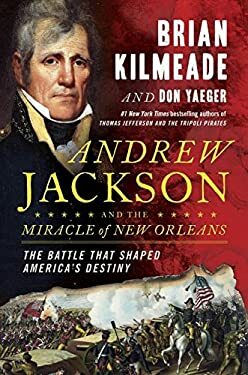 As they did in their two previous bestsellers, Kilmeade and Yaeger make history come alive with a riveting true story that will keep you turning the pages. You'll finish with a new understanding of one of our greatest generals and a renewed appreciation for the brave men who fought so that America could one day stretch "from sea to shining sea." New (228 available) BRAND NEW. Over 1.5 million happy customers. 100% money-back guarantee. Make your purchase count: support Better World Books' worldwide literacy partners.